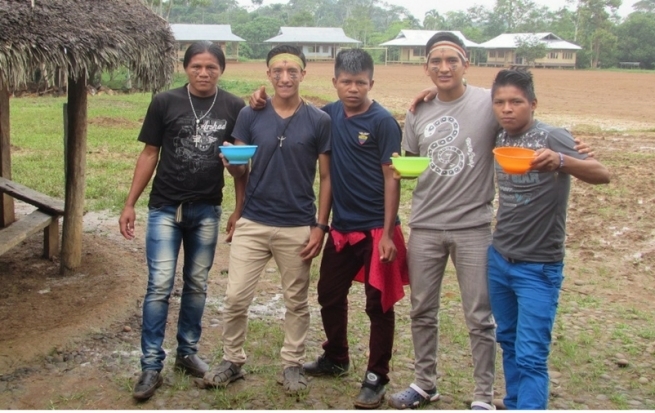 (MissionNewswire) Salesian missionaries operate a youth hostel and school for disadvantaged youth in Wasakentsa, an area in the city of Macas in southeastern Ecuador. The Salesian community currently provides housing for 40 boys and girls who attend the local Salesian school, which educates 120 students. Edwin Fernando Cárdenas became a Salesian in 2013 and began his work in Wasakentsa. In the 1970s, the Achuar came to local Salesian missionaries, Father Domingo Bottasso and the late Father Luis Bolla, and requested they develop programs to help educate youth in the community. Building on those early initial programs, the Chankaup Foundation provides sustainability to the work of the early mission and has expanded programs by developing activities with the goal of communal development. Most recently, the foundation has developed a program whereby local products found within the forest and vegetation are sourced and utilized by the villagers to earn an income through cultivation and sale. The work done by the foundation allows Amazonian families to participate in the global economic market to improve their income without abandoning their cultural and environmental mission. About 600 families in 60 communities of the Amazonian region, provide the raw matter for the processing of products. The products that are used include peanuts, cocoa, ginger, curcuma, verbena, achiote, dragon blood and more. The raw materials are first treated, which provides an added value for trade. Ecuador is one of the most inequitable societies in the world, according to UNICEF. The richest 20 percent of the population receives almost 50 percent of the national income, while the poorest 20 percent receives only 5 percent. According to the World Food Program, almost 26 percent of all children under age 5 have stunted growth, increasing to 31 percent in rural areas and 47 percent in indigenous communities. Close to 20 percent of Ecuador’s population is people of indigenous heritage. For poor, rural and indigenous youth, education provides the best opportunity for finding employment, reducing inequities and breaking the cycle of poverty. Salesian missionaries have been providing education and other social programs for disadvantaged youth across Ecuador for more than 125 years.